Each one of us has at least one place which represents a moment which changed our life. For Ernest Hemingway - more than he could ever have said (1), nor we imagined – the river Piave (2) was that place. Ernest arrived there as a boy (3). He thought of war as a football match and the enemy as the away team (4). He wore a made-to-measure uniform on which the stripes of a second lieutenant were stitched . Whatever their age, all the American Red Cross boys were at least second lieutenants, so, as far as the troops were concerned, they were officers. The Italian officers spent time among them, in the canteens and at the command posts; these were educated men and some of them spoke English. They were certainly much more mature than Ernest. Even the infantrymen, marked by years of combat and discomfort, seemed older. With them he shared wine and women and all those experiences which would have been unthinkable at home in America. The American Red Cross had entrusted him with running a canteen post, putting men and materials at his disposal, and even a bicycle on which he could move around without asking anyone's permission. He was a protected boy in a grown-up world, and he was held in consideration both as an officer, and also as an American. What more could anyone have asked for in that particular time of life when unexpected freedom suddenly throws open the doors onto a seemingly limitless world? Despite ARC volunteers being forbidden to go near the front line, it was not the first time that Ernest had gone to look at the Austro-Hungarian trenches. 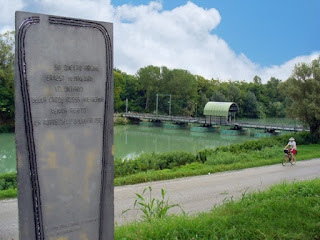 That place where the river points in an 'L' shape towards Fossalta is famous (5): just before the last battle the Czech Lieutenant Stiny went by with the Italians bringing important news about an attack. His friends from the Ancona Brigade were right there, they would not cause problems. He left his bike leaning against the last houses at the foot of the river bank and climbed the short slope. It was hot, and the men were sleeping in holes dug out under the top of the bank. By day one could sleep, it was darkness which made everything difficult: all the eyes in the world would not be enough to see what was going on on the other side of the river. In the dark all you saw was fear. On the curve behind the river bank there was a large dug out protected by earth where he used to go to chat to the soldiers. It was dark by the time he left the command post dug out at the foot of the river bank. He went up to the trench at the top of the bank, and made his way down towards the side of the river, before walking along the tow path which passed in front of a house whose roof had been blown off by mortar fire. The smell of day's heat had been replaced with the sound of the front line. A little further on, the reflection of a flare died on the still water of the river. In the gun emplacement were gunners and a machine gun. It does not take many men to control enemy lines; there would not be any sense in sacrificing more men than necessary on a position that far forward. It was an excellent position because from that point you could see down the river in both directions. The trenches were so close that each had a clear idea of what was going on on the other side. A whispered conversation, the glow of a cigarette, or an unexpected sound, and the Austro-Hungarians on the other side, suspecting action, would send back a bombardment on the Italians (6). ''Through the other sounds I heard a cough, then came the chuh-chuh-chuh-chuh, and then there was a flash''. The aim was perfect. The explosion, white, then red, then purple, and the movement of air, carried him with it while taking the air from his lungs. He had no time to think, he only felt himself dying. He finished up, semi buried beneath sandbags, beams and other detritus which continued to rain down even into the water; first the largest pieces, near the Italian bank, and then smaller and smaller across onto the opposite side. In the darkness he realised that near him one of the soldiers was dead, another was crying out. The shock of the explosion had anaesthetised him (7) so that he did not feel the many splinters of shrapnel which dug into his legs. All he could hear with his ears was the buzzing of shattered metal. His heart must have been bursting in his breast while the adrenaline warmed his veins. He should not have attacted the attention of the enemy, indeed he should never have been there at all. Now he could have stayed where he was, pretending to be dead, waiting for help to arrive; instead, automatically, he began doing what he had been taught to do which was to pick up the wounded. The height of the average Italian soldier at that time was 1.60m while he stood not far short of 1.90m. He slung the small soldier across his wide shoulders and started making for the the trench below the bank. The Austro-Hungarians, pleased to have hit their target, launched a flare to see what was going on; it exploded high, illuminating the trench and the ruins of the house on the river bank. This scene, in a yellow flash, remained in Ernests' eyes, becoming the synthesis of his perception of the moment. The image of that house on the river bank would remain in his nightmares as the representation of distress. From the other side of the river they began to track him with machine gun fire and hit him first on his left thigh and his right foot. He got to his feet again, made his way for another fifty meters trying to reach the shelter of the bank. He was walking badly, inside his boots his feet felt as though they were squelching in hot water. He was bleeding from a head wound and thick blood ran down his neck. He was hit by a second burst which hit him on the right knee and which sent him, and the wounded man, tumbling down into the trench on the bank where he passed out. At first he was given up for dead. The officers were alarmed, not merely on his account but because of the trouble he had caused. They would have to answer for a great many things. Meanwhile, the Italians, put on the alert by the explosion, thinking it was an attack, started firing their artillery across the river, and the orther side immediately began firing back. The night of 8th July 1918 should have been a quiet one. This experience destroyed any myth he might have had of a 'just war', fought with force and the purity of ideals. He realises that many Italians do not want war. He sees signs of their mistrust towards governments, and orders that are far removed from ordinary people who want victory even when faced with the unspeakable sacrifices of soldiers, they are insulted by propaganda. He will write (8): 'I suppose it is just the loss of the immortality... well, in a way, that is quite a lot to lose'. The immortality to which he refers is also that of his youthful ideals, the myths of truth and justice which were killed not so much by the explosion as by the betrayal perpetuated by greater interests which held sway over the wishes of the people and drew advantage from that. He was not frightened of dying, something that at that point he believed to be quite simple, but of dying in order to pay someone else's bill without meaning to. The young man's illusions die on that river bank and, from there, a man who no longer believes there is anything worth fighting for walks away. This is the detachment of the 'lost generation' - the period in which he lived in Paris that was characterised by a resigned individualism but which would slowly disappear as the tensions in Spain led to civil war. Ernest returns to pure ideology, choosing to align himself with the wish for self-determination, an absolute value which cannot fail. He defends the idea of the Repubblic because it is the only form of democratic government which he believes possible. The war in Spain will teach him that no one can fight for what is right without remaining marked by it; you cannot fight a war without getting dirtied; someone, on one side or the other, will feel authorised to justify the violence and twist truth into propaganda thus perpetuating the betrayal of truth, of justice, and of robbing the sacrifice of the dignity of purity. For years to come, he and his pen will fight on. But he will have his eyes wide open and firmly fixed on the the true wishes of the people. He will denounce the manoeuvres of the various systems of interests and he will remain steadfast in the struggle, which he believes to be the only true measure of the dignity of man which, even when faced with the certainty of losing, cannot betray itself. He returned to Italy one more time to work on 'Across the River' with the old soldier spewing forth confused memories. In the silence of the morning, gazing at a lagoon landscape of almost heartbreaking beauty, he rediscovers his love for this country, a love which now he finds in a time of peace. He returns to the river bank one last time, not like those veterans do as they search for their lost youth, but in order to settle his accounts with the fear of having sacrificed himself without properly understanding or making a conscious choice. On the river bank every trace of the trenches had disappeared, the wind caressed the grass on the top of the ridge. Ernest saw once more the house on the river bank, it had stood witness to all the events but it remained standing, and it still is now, although rebuilt. In front of the house he searched for the crater of the explosion, then he pulled down his nut-brown trousers (9), and with the delicacy of an old knight (10), he prepared for a cerimonial evacuation of his bowels. But nothing came, so he dug a small hole in the earth and buried a thousand lira banknote which corresponded exactly to the value of the pension which received, then he filled in the hole and stamped down the earth, just as people do after planting seeds. His sowing of the seeds had begun in 1918 with the burial of youthful illusions; it was a carelessly made sacrifice and his voluntary efforts to an ideal had been betrayed. If he had not returned to justify his actions then his would have remained a useless sacrifice. The mature man, who had given form to his own ideals, could not leave that sacrifice without justifying it, so he returned to tie together all the paths it had taken. He put the money in the hole. He did not want anyone else to pay for the sacrifice he himself had made. He had not done it for the money. He left the money gladly to this earth which still needed so much support. ''It's fine now,' he thought (11). 'It has merde, money, blood; look how that grass grows... It has everything. Fertility, money, blood and iron. Sounds like a nation. Where fertility, money, blood and iron is, there is the fatherland.'" The Second World War had just finished and there were great expectations of the future. Through that ceremony he found again his careless youth, he recognised it again as the sower, justifying his sacrifice as part of the birth pangs of a new nation, and it returns to him the dignity of blood spilt by the pure of heart. Before leaving, he concluded his visit to the old front with another ritual. He stood up between the reeds on the river bank, raised his eyes and looked across the river to the point where the enemy lines had once been, and he spat. They did not make jokes out of boastfulness. Hemingway believed that truly brave men are always cheerful. The fact that he now succeeded in spitting well, right there on the very spot where fear itself had bewitched him, was proof that he had finally worked through the idea of how one might die for a just cause without remorse. Above all it was proof that the old sacrifice he had never 'wished for' now demonstrated itself to have been shared by those men alongside whom he had contributed to both freedom and its political consequences. On the bank of that river at Fossalta where the careless young man died, another man returned; the river saw that he had never ceased to fight even with his incapacity to justify human fear. This return concluded another cycle. 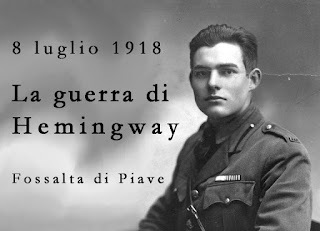 The man who spat now was no longer the young Ernest, but neither was he Hemingway the mature combatant. Another man went away from the Piave river: it was an old man who will no longer write of soldiers and wars because ''he declares a separate peace'', a peace where destiny welcomes courage and fear without perceiving any difference between them. Now he would write of an old man fishing in a sea he knows well, a sea which is capable of containing both good (fish) and evil (sharks), challenging both himself and destiny. The sea is God, the patient one, who asks no questions, and allows those who wish to do so to play according to their own natures. It is in that very awareness and the wish to be part of that game that the old man finds peace: he is now at one with his role. (6) This type of armaments, defined as trench artilliary, were the precursors of modern mortars. The sound when it was fired was generally more muted than that of common artilliary, so that it could indeed be confused with the sound of someone coughing. Ernest describes the mortar as having a 5 gallon or 20 liter keg which might lead us to deduce that it was a 225 m Bohler Minenwerfer. The shells launched were not stabilised in flight like artillery shells, so that during their revolution the different effects of the air produced different sounds. (7) The energy of an explosion expresses itself in vibrations of differing frequencies, therefore just as loud noise can cause deafness, so vibrations are capable of killing nerve endings. (10) On the front line a soldier would never leave his trench to do his business for fear of being hit; he did it where he was and then threw it out with a shovel. The delicacy of his companions came from their taking no notice.